Wow, its been a while since the last post. In the meantime I have hit my sewing low. Only 1 creation in almost a month! But I had been tired and work had been busy, and we had been putting new flooring in our house ourselves. Hopefully it will get a little better next month! I got a little lazy about finishing off the edges, so i just took a elastic black lace and attached it to all the edges. I think it gives it a very delicate look! It has a kimono sleeve top part, plus a rectangle stripe of midriff which extends into a tie, and a gathered skirt. All in all, I am quite happy with the dress. It is delicate and comfortable, almost makes me want to buy another yard of the bamboo jersey and make a lingerie slip with the same stretchy lace. I think it would also be great as a maternity dress, though i might need to shorten that midriff part if it is to be one. On another note, spring is here! 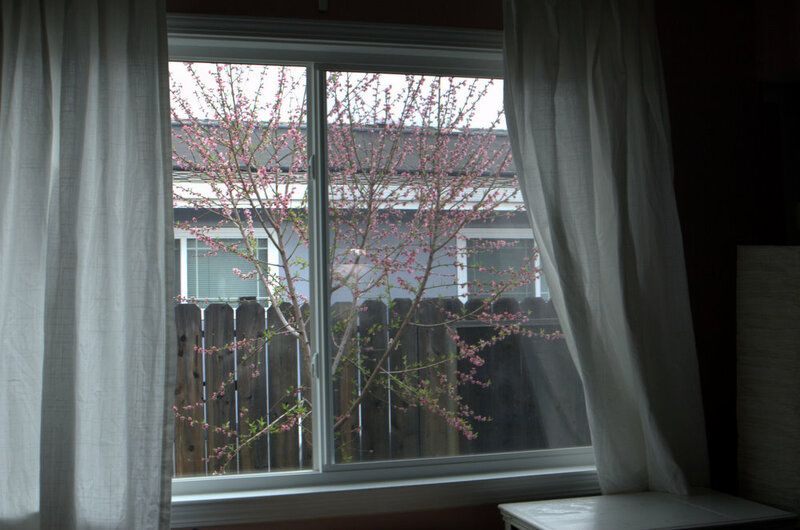 My peach tree in front of the sewing room window is flowering again and I am looking forward to all the yummy yellow peaches this year. Too bad all the fungicide I sprayed last fall for peach curl didnt seem to work 😦 hopefully it would still perform as well as last year. This entry was posted on Sunday, March 20th, 2011 at 2:27 pm	and posted in finished pieces. You can follow any responses to this entry through the RSS 2.0 feed. Oh it’s so nice! 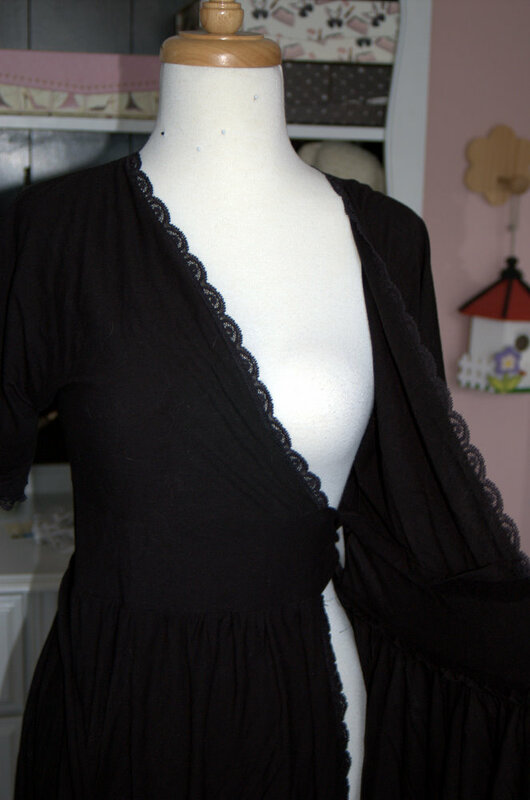 I really like it–I’ve been seriously considering conquering my “fear” of knits so I can make myself a black wrap dress. do it do it! 😀 i didnt like the idea of knit too — its so unstructured and so forgiving 😛 but it makes a good quick project! Very pretty, I have been thinking of a knit wrap dress lately also. The lace is a nice touch. thank you! 😀 would love to see one made by you! Oh what a cute dress!! I love the edging! I believe it’ s very comfy! I looks great on you. I should try some jersey dress too. heeheehee, okay i will! time for more bamboo knits! thats a good idea! 🙂 i love your pink knit dress too! would love to see the nursing one from you! Such a beautiful dress, lace is a sweet detail for edges. I have to keep my eyes open for bamboo knit, do you order this via internet or in a local store? I bought some black jersey for my spring dress is in so i start sewing at weekend. I bought also burgundy tights. I love black skirts/dresses combined with colorful tights. wooo, i wonder what kind of tights you buy. the ones i have would stick to the jersey material so the dress would be very clingy… so i cant wear mine with tights! i wish i can though! i bought my bamboo knit from online a while back, however, i had been seeing it in my local hancock/joanns, in the knit section. there’s usually 2 or 3 colors only though! hopefully they aren’t clingy. while wearing these five minutes at home that wasn’t so extreme. I’ll give you an update after wearing tights with dress one day. Thanks for the information, i’ve to keep an eye at my fabric dealer. I’ll buy another pair in black for every day. I love the lace! So pretty! I bet this will be so comfy to wear to work when I teach. Hmm….how hard do you think it will be for me to sew? I bet it would take me months! Oh I just love this wrap dress. The little lace trim is delicate and lovely. I have been thinking of making something similar and now I may just have to!